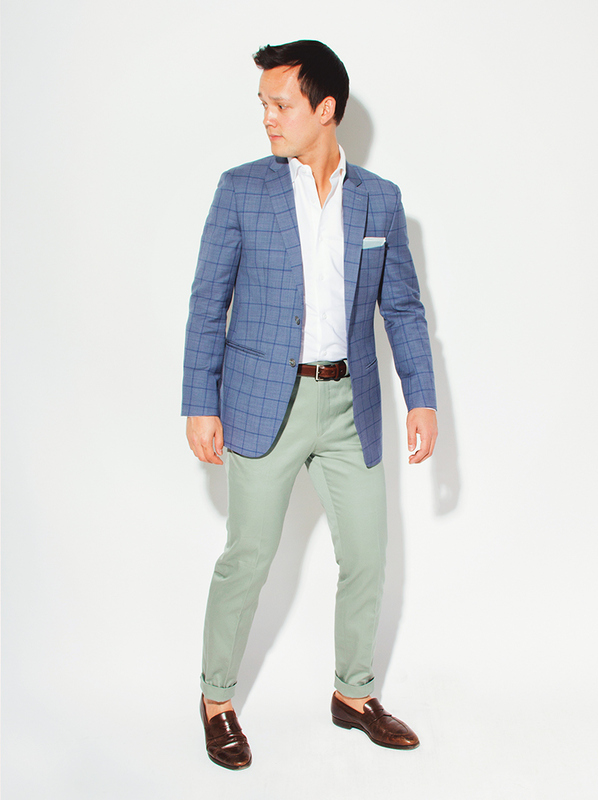 Styling Overview This crisp oxford blue jacket mirrors the color of the windowpane pattern on the trouser. To achieve balance wearing a patterned trouser, pair it with a solid jacket that plays off the pattern’s color. Keep the finishing touches simple with a crisp, white shirt. 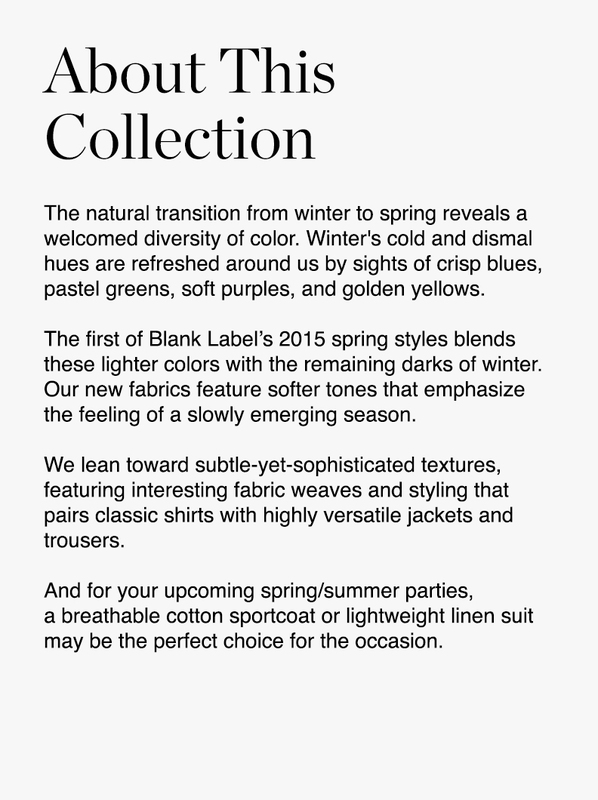 All Blank Label clothing is custom-made to fit you. Styling Overview This soft grey meshes well with the fresh light blue pattern. 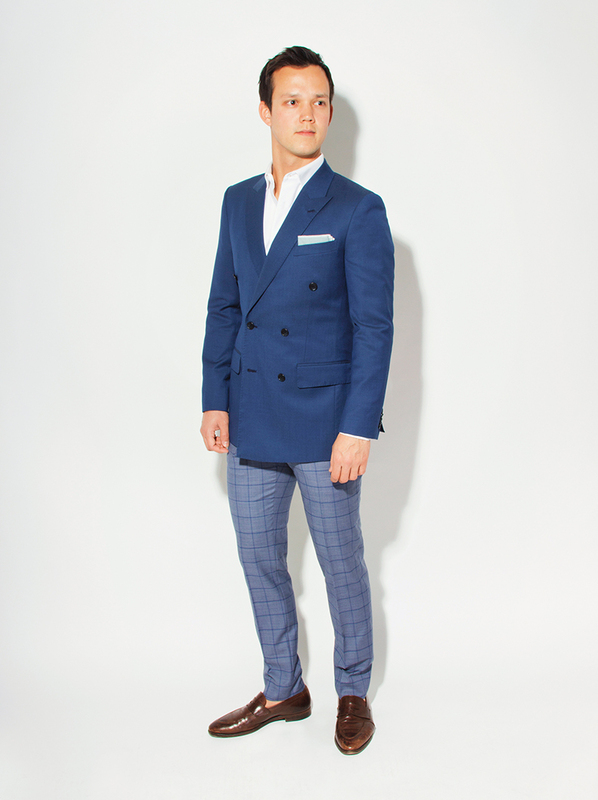 Windowpane is ordinarily seen in suit separates, but this full-suit fabric pairs nicely with a calm, blue shirt. Styling Overview The warm tones of this fabric are calmed by a crisp white shirt and deep blue tie. Styling Overview A rich navy slides in as a seasonal placeholder for our traditionally black tuxedo. During the spring and summer seasons, it’s nice to liven up your formalwear. This shawl collar blue tuxedo is unexpectedly stunning, perfect for a special occasion. Styling Overview If you are going to wear a bold jacket, let it be the focus. This look creates emphasis by pairing a bright jacket with a subdued shirt and trouser. The crisp off-white jacket takes the lead, complemented by the simple shades of navy. 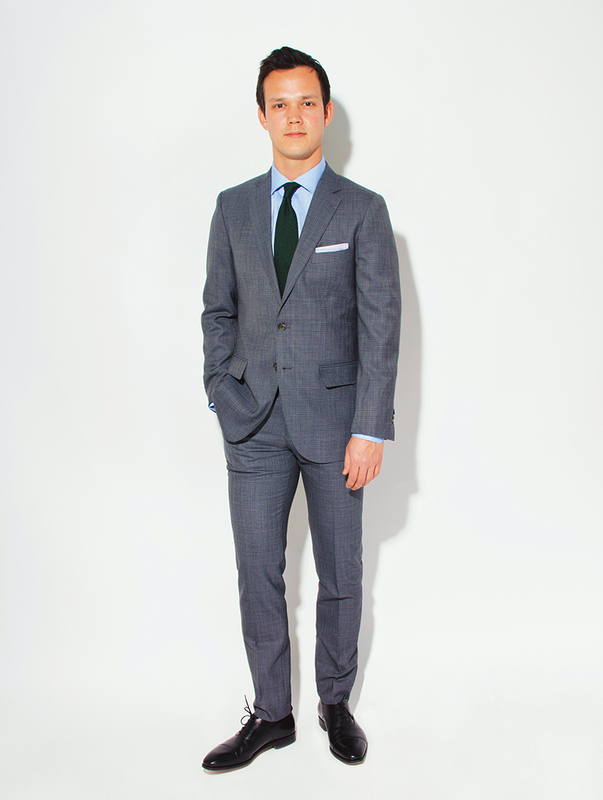 Styling Overview A charcoal suit is a timeless garment. This subtle micro-plaid offers brand new character to the traditional suit, perfect to wear for any occasion. Here, the quiet of gray is awakened with crisp blue and rich green. 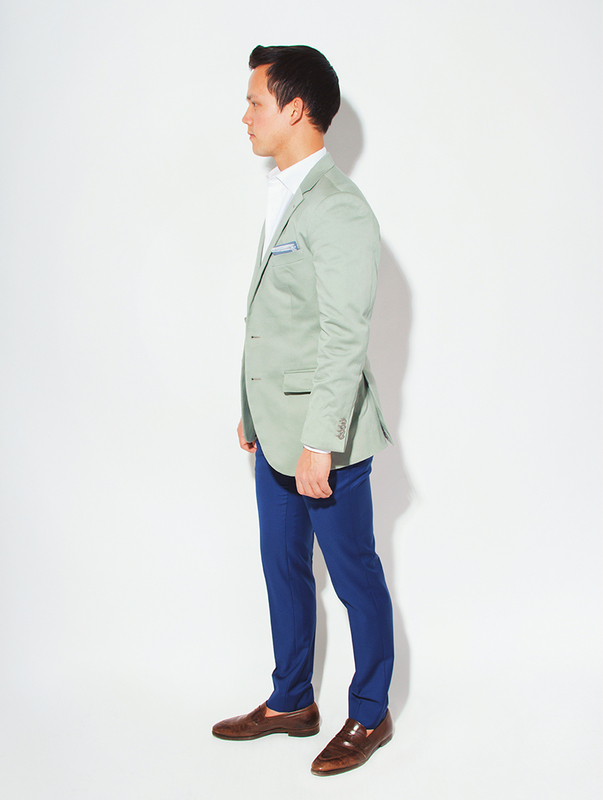 Styling Overview A bold colored jacket is easily tamed by a classic trouser and simple shirt pairing. Here, the crisp shade of blue compliments the soft sage of this cotton jacket. A clean white shirt ties it all together. Styling Overview For those rainy spring days, put on a custom-made trench coat to keep your suit dry. The Blank Label Trench Coat is set to be the newest custome made line within our collection. Available soon in Khaki and Navy. Styling Overview At a summer wedding or out for drinks? 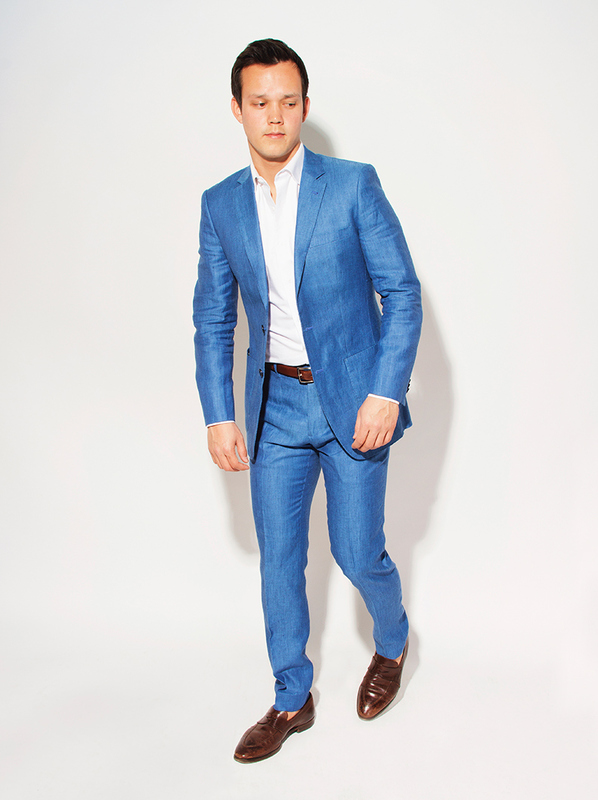 This blue linen fabric is lively, breathable, and sure to make a statement. Styling Overview This bright navy cotton suit is accompanied by a multi-tone blue tattersall shirt. The fresher shades of blue, when paired with a pattern, create an interesting yet balanced monotone look. Styling Overview This soft blue patterned jacket wears well with our sage green trouser – a balance of the fresh, familiar colors of Spring.